Dana (far right) says one of her favourite moments since coming to Canada was at a potluck soon after arrival. By chance, her family met a woman at the potluck who was from Darayya—the same suburb of Damascus as the Mellis. She’s now become a close friend of the family. The Melli family think about their journey in terms of routes. There are the one they took to flee their apartment in a suburb of Damascus, and the roads that take each member of the family through HRM to their respective language classes. Then there are the daily adjustments to an unfamiliar place that nonetheless loom large when the family thinks about the ups and downs of their new life. Case in point: Ask Mohamed Melli, husband and father of five, what's been hardest since arriving in Halifax on January 12 of last year and he thinks a moment, then replies via his daughter Dana, who laughs as she translates. "He says that sometimes people here don't signal when they change lanes." 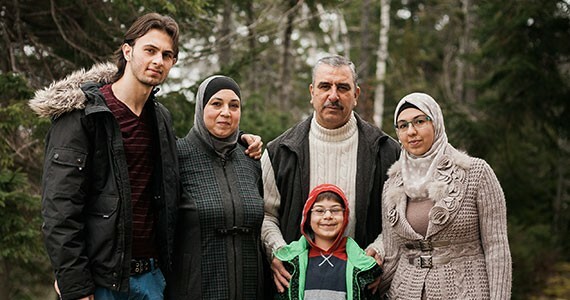 The Melli family are five of the roughly 1,000 government-sponsored refugees who landed in Nova Scotia in 2016. Like other families, they've encountered highs and lows as they settle into life in Halifax. They're luckier than many—Mohamed has found work as a mechanic at a car dealership in Dartmouth, where with some adjustments (he was unfamiliar with snow tires, and American cars) he's continuing the trade he practiced in Syria. Dana, 20, is a scholarship student at the East Coast School of Languages. On the day after her one-year anniversary in Canada, she's started an application to study pharmacy at Dalhousie in 2017. Her younger brothers, 17 and six, are finding their feet in high school and elementary in Bedford. But there are challenges too. For government-sponsored refugees, the bulk of federal assistance ends with the start of their "13th month," the vaguely apocalyptic term given to describe the point, a year after arrival, at which federal funding dissipates. Like any other family of five, getting by on one income will be a challenge for the Mellis. So will being separated from their other family members. Dana has two sisters still living in Jordan; both married to Jordanian men, who decided to stay rather than move with the rest of the family to Canada. Their mother, Taghreed, is eager to see her daughters again, especially as one recently had a child. "She needs to hug them," says Dana. But getting back to Jordan on the family's current budget is unlikely. For now, they're together only on social media. Then there are the bigger issues. Donald Trump's effective ban on Muslims travelling to or settling in the United States, the constant rumblings of Islamophobia at home and abroad and the occasional explosions of that Islamophobia–as with Sunday's terrorist attack in Quebec City–have cast a pall over both Canada's optimistic (though imperfect) plan to settle 25,000 refugees, and the individuals who've arrived here through that plan. For families like the Mellis, the events of late January are an additional source of anxiety at a time that's already marked by uncertainty. In 2012, the Melli family was at home in their apartment in Darayya, a suburb of Damascus. The neighborhood had been under siege for days. But through the warfare, the family hoped they'd be able to wait it out. Then, one day in November, they heard shouting coming from outside. Fighters in the street were calling for residents to leave their homes. "They were shouting, 'Leave the city or you will die,'" Dana remembers. "We had to leave immediately, so we very quickly found some clothing and some important papers...and then we left." Dana had an aunt living in a different part of Damascus, and so the family went there, but the arrangement was far from perfect. They were staying in Rukn al-Din, a once-ordinary middle-class neighbourhood that had become the frontier to a warzone. Dana and her siblings "couldn't go to school," she says. "One of my sisters was doing her degree at university, but she couldn't go because of the bombs, and [anytime] she went out from the house, we would be worried all the time until she came back." Mohamed was growing anxious about his children's education. Meanwhile, because his garage was in a part of the city that had been shut off, he couldn't get to work, and their money was dwindling. Day by day, life was becoming more difficult. After a little over a month, the family made the difficult decision to leave Syria altogether. They packed their car and drove to Jordan, where they declared refugee status. Dana and her brothers resumed studying, and Mohamed found work at a garage. After a few months, they even had their own apartment. Life was better, but still there were hardships. Dana's brothers were being bullied at school for being refugees (and eventually stopped going), and Mohamed was making little money as a mechanic. The whole time, the family continued to apply for refugee status, trying to reach Western countries—excluding the United States. They knew very little about America, Dana says, and in any case, what they did know made them concerned what life would be like there as a Muslim family. In November of 2015, word came they had been accepted by Canada. The Mellis sold their furniture, got rid of their apartment and prepared to move halfway around the world to a country they knew little about. 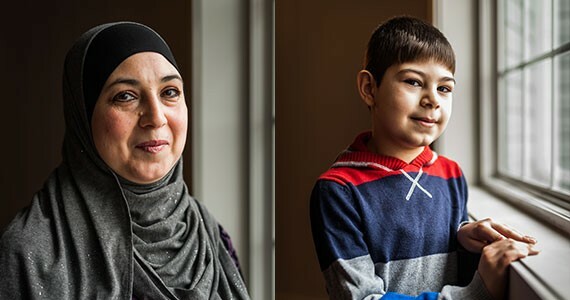 For two weeks after arriving in Halifax, the Mellis lived at the Chocolate Lake Best Western, along with nearly 700 other government-sponsored Syrian refugees who came to the province in January and February of 2016. "At the hotel, people welcomed us a lot," says Dana. "It felt like it was our home country; it made us feel less stressed." Finding a sense of home has been easier for some than others. No one in the family has adjusted faster to life in Canada than the family's youngest child, Abdulrahman (Abdul). Taghreed (left) says one of her favourite parts of being in Canada is the access to nature, particularly in the summer and fall. Abdul is a student at Bedford South Elementary. Like many six-year-olds, he's shy around strangers and hides in his room when curious newspaper reporters visit the Mellis at their apartment—which is what's happening today. Mohamed tries taking away Abdul's video game console in an effort to make him join the rest of the family in the living room, but when that fails, he settles for making Abdul shout out the English translation to Arabic words in return for getting his game back. From inside his bedroom, Abdul's disembodied voice acts as the family's impromptu translator, dissolving into giggles at the end of every word. In fact, Abdul is learning English so fast that he has the opposite problem his parents do. "We actually worry about his Arabic, not his English," says Dana. 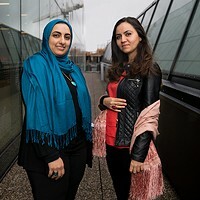 "We speak Arabic at home." The family is also wondering how they'll teach Abdul about Islam in an environment where he's not learning about it at school, as he would have in Syria. He'll likely learn at home instead, especially since the family's schedule rarely allows them to attend mosque on Fridays. Either way, Abdul has taken to his Canadian home briskly. "His pronunciation is much better than mine," says Dana ruefully. Abdul is one of approximately 1,600 English as an Additional Language (EAL) students studying in the Halifax Regional School Board. His school has one of 13 dedicated EAL teachers in HRM assigned to specific classes. Another 12 full-time teachers and one part-timer circulate between different schools. Among those teachers are six that were added last September to assist with the integration of roughly 500 Syrian students. 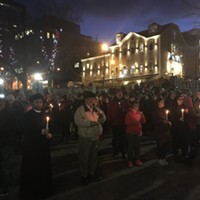 Sonja Grcic-Stuart, EAL consultant for the HRSB, says that even as the arrival of Syrians to Halifax slows, the number of EAL teachers is not likely to drop. "Where Halifax is today, with our focus on immigration and immigrants coming in, I expect the number to grow, not decrease," says Grcic-Stuart. Dana attributes Abdul's rapid progress to his being surrounded by native-English speakers, and Grcic-Stuart says this is a key part of what makes EAL support work. "The opportunity for students to be immersed with English-speaking children in the school system—do not underestimate the value of that." It might seem parochial to dwell on the Melli family's efforts to learn English, and while it's true there are many other aspects to adjusting to a new life in Canada, it's hard to overstate how isolating it can be not to be able to communicate. 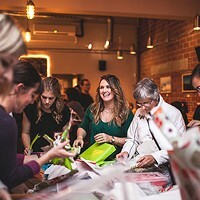 "I would say that the number one barrier to integration into a community is language," says Carol Derby, head of language services for ISANS. "If people can't speak the language, then they can't communicate with their neighbors; they can't go open a bank account; they can't talk to their children's teachers." Derby says while individuals differ, research suggests it can take an EAL learner between two to five years to become proficient enough in English to secure work. Thanks to an ISANS program that supported him in his first months on the job, Mohamed has already crossed that hurdle. He and Taghreed both take classes Monday to Thursday evenings as well, through the HRSB's adult learning program. For Dana, learning English isn't just practical—it's the difference between getting dragged down by the weight of homesickness, and the ability to find an outlet for it. "For a long time, I had all this emotion in myself, and couldn't express it," she says. "Now it's better." 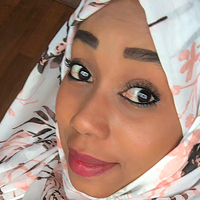 In glasses and a brightly patterned hijab, the 20-year-old is quick to laugh, even at her own infrequent language mistakes—all the same, she makes sure to ask for only the quotes in which her English is best to be used in print. Dana's nearly done the East Coast School of Languages' program to prepare EAL students for university. By the summer, she'll have finished all the language training she needs, and plans to spend her "vacation" retaking some math courses and volunteering. There's a sense of urgency to her undertaking; most people her age, she reasons, are already in their third year of study at university. When "I moved from Syria to Jordan...I missed education during that time...and then I came here [and spent] one year to learn English," she says. "In 2017 I really would like to be a university student and achieve my goal, achieve my dreams." Many markers of belonging in a place are things we think little about—the ability to navigate a transit system, or having a friend nearby to visit. For Mohamed, it's his Nova Scotia driver's license, which he holds out with pride. It's a connection to one of his favourite experiences since coming to Canada: The road to Walmart. He merges back and forth between Arabic and English as he describes the moment last winter when, returning by car from the Walmart in Bedford, he and Taghreed got lost. They returned to the store, explained they were from Syria and said that they had lost the route home. An employee got in his own car and led them back to their apartment. Mohamed says it's those kinds of experiences—there have been several—that make him feel understood, even across the language barrier. "It makes us feel that people understand we're coming from a hard situation," he says. And then there are the endless small adjustments. For Taghreed, who loves to cook, this means learning to make recipes without some of the ingredients she once used. She tinkers and substitutes while planning meals—like the feast of kibbeh and tabboule and birthday cake the family ate to celebrate the anniversary of their arrival in Canada. The kids, meanwhile, have expanded their diet to include some North American staples. "Poutine," says Baheej, a lanky 17-year-old who attends Charles P. Allen, when asked what new things he's tried since arriving. "Do you know poutine?" Dana asks. "I tried poutine, which is really delicious. We heard about lobster but we haven't tried it yet." Maybe there'll be lobster in the year ahead. Dana isn't sure. She's suspicious of seafood, actually. But as far as the future of the family is concerned, it's the youngest member who the Mellis all look to—who exemplifies what they hope for themselves as they build their life in a new home. Abdul "can achieve what he wants," Dana says. "I think his future is in Canada." Moira Donovan is a freelance writer in Halifax.